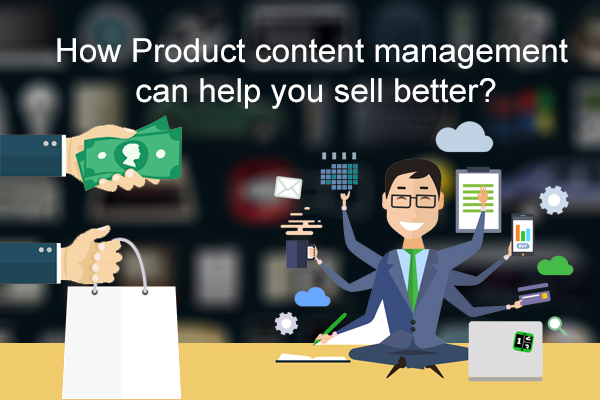 How Product content management can help you sell better? Are you an E-commerce business that maintains wide-range of products on multiple marketplaces? It’s vital for a business to manage accurate and engaging product information. However, this is a challenging and time-consuming task. Many online retailers face the same kind of issues and to deal with it there are various product content management solutions introduced like KartzHub software that offers the convenience of managing the product contents efficiently. So, let us first start with what exactly is Product content Management? Product content management (PCM) is a widely used term for managing product information in order to sell or market the products in different channels. This is a dominant product data used by the company to feed information to websites, ERP systems, Printed catalogs, media, and other trading partners. Update and manage the contents across all sales channels from a single location. Combine all product information and relevant contents while providing easy accessibility to all users. Categorize your products and manage the catalog systematically. Easily add new products and special offers online. Provide shoppers with an appealing and engaging content. One-time listing is required to update into multiple channels. How PCM is helpful for a seller? PCM helps to save a large amount of time & money thus giving seller sufficient time to concentrate on other business activities. It also helps to improve the customer experience for buyers. Get complete control – PCM helps you to have full control over all aspects of the product content across all channels. Scalability – It helps your business to grow with the easy addition of new products within a few minutes. Enhanced customer experience – Customers have access to rich product information. Save time and money - You can add products or update the products within few minutes and without the need for additional resources. Reliability – Your marketing and branding will be consistent, reliable and customer targeted across all channels. There are a number of solutions and software's doing rounds in the market to make the online businesses successful. But opting the right one that will help you manage all the inventory and back-end process without the need of external resources is important. A good PCM solution has the ability to add, edit and update product description, images, attributes, categorization within few clicks and from one central location. KartzHub is the best inventory management tool that gives you the privilege of not only maintaining the product data but also helps in managing inventory, order, shipping, and accounting. To know more take our free 14-day trial or talk to our executives. Are you selling on Multiple Marketplaces and struggling? Many sellers have this issue of facing competition with the imitation products. These counterfeit products are not only sold at a lower price but also have low product quality which results in the bad impression of your authentic product. Sellers selling authentic products are unable to reprice their products due to continuous change in the price of the competitor’s product and are also unable to track the competitor status. 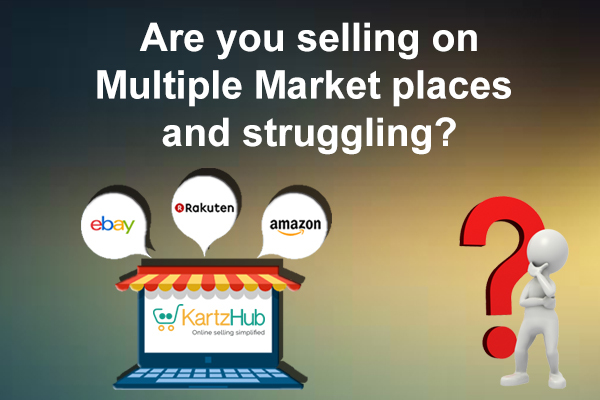 KartzHub keeps the track of the competitor on board 24/7 by tracking the competitor having a similar product as yours and automatically reprices your product thus maintaining its authenticity and your profit margin. Many sellers face this problem of low-profit margins while selling on multiple marketplaces. Every marketplace has a different monthly seller fee, shipping fees, closing fees, and referral fees. This is the cost every seller has to pay for doing business on an already built selling platform. The seller also has to deal with the tough competitive price ranges thus forcing them to keep their price low. KartzHub helps the seller to timely upscale and downscale the prices as per the market and competitor scenario. For example, if the competitor’s product is out of stock, it will increase your product price thus offering you high profits. When selling on online marketplaces you don’t have to worry about maintenance, set-up or branding. Sellers just have to follow the selling rules set by that particular marketplace. However, when the platform makes some major changes, the fees increases, and the changes may also disturb your selling and settings. Selling mistakes also have a bad impact on the sellers account leading to the suspension of the account for some time. These mistakes may be due to not keeping up the accurate stock levels. As you are selling in a rented marketplace, you strictly have to follow the marketplace selling rules. 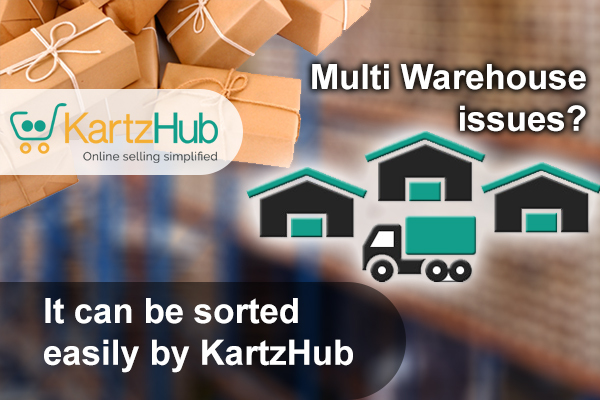 KartzHub helps the seller to keep up with the stock levels thus reducing mistakes like overselling or out of stock. Some marketplaces sell their own product as well, thus making you compete with them. You on the storefront can keep a track on such products and analyze which marketplaces to choose from, which one will be profitable for you and how to take a complete control of your selling. KartzHub is the only answer to this. We encourage our sellers not only to sell on multiple marketplaces but also to sell effectively. Choosing the right platform that suits best for your product is also important. Our KartzHub executive would guide you to select the best marketplace and ways to market your product. To have a hands-on experience of our software you can take the free 14-day trial. Many ecommerce businesses start their journey of selling with a single warehouse to stock all their products. With a single warehouse, it is easier to keep the accurate count of your inventory. When a business starts targeting the global audience, there arises the need of opening multiple warehouses at prospective locations. For example, if you have a warehouse in New York and you have a growing customer base in Los Angeles, the transport costs to deliver the products would increase, thus forcing you to keep the rate of the products high. But, if you have another warehouse on the location from where you receive maximum orders then your fulfillment costs will reduce thus making it a profitable affair. fulfill the orders as per the supplies. Inventory analysis: Understanding the supply and demand of every location is very important, as it may vary depending upon the change in trend, seasonal changes, and location preferences. So, if every warehouse has different products as per the location, it becomes difficult to manage and track the products. Maintaining Stock count: Stock counts and sales can easily fall out of sync if you don’t have a streamlined approach to your inventory. There are chances of many people handling the products and so chances of human errors are also more which may lead to inaccurate inventory counts. This may also result in having zero knowledge about the out of stock products leading to inefficiency at the time of fulfillment resulting in lost revenues and bad customer experience. Mixing up the processes: While maintaining multiple warehouses, there are chances that maintenance of processes of every warehouse is carried out in a different way (Like inflow, outflow, and invoices). Improper processes lead to mixing up of orders and shipments between warehouses if you are using a centralized filing system. Every warehouse tends to be at a distance with different employees handling each warehouse, resulting in communication issues. Missed messages may cause bottlenecks and errors because of the lack of face-to-face communication and discussion on streamlining the processes. Should you ship it from another warehouse directly to the customer? Will the fulfillment cost be more? Will it fulfill the customer order on-time? This can be resolved only if you have full visibility of your stock across all locations. Customers checking your product page are not interested from which warehouse the product is supplied, they would only check if it’s in stock, till when it will arrive and how much will it cost including the shipping. You need a system to keep the stock levels up-to-date across all warehouses. You should be able to monitor and update the stock levels across all locations. 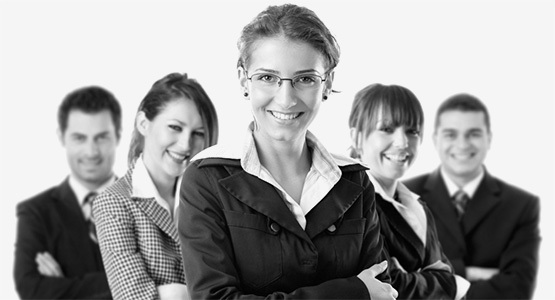 Sync with other crucial business processes like shipping and accounting. Cloud-based software to track your inventory from anywhere. The efficient dashboard that offers transparency of your inventory and operations. Discover the power of this next generation software through KartzHub. It’s the only platform that provides inventory management, order management, listing into many marketplaces, shipping and accounting at a single location at an affordable price. 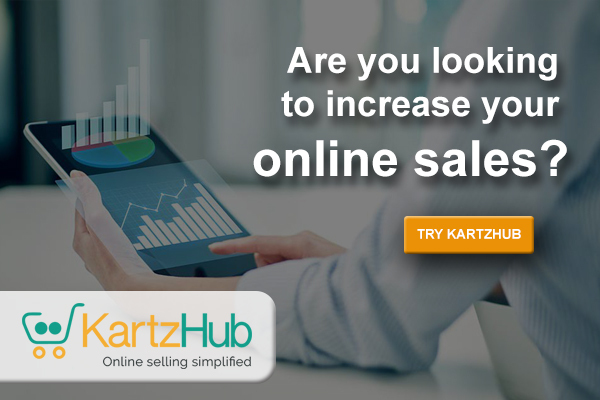 Take your business to new heights with KartzHub. To test our software, take our free 14-day trial or talk to our executive for more details. Recent research revealed that among more than 2000 UK adults claimed how a good online and mobile technology influences the success of a business. When asked, about 59% of UK adults were of the view that they would leave a business website in just 30 seconds if the website is either ugly or difficult to navigate. Whereas, 24% of customers said that in the last five years they have switched loyalty from one company to a competitor if they found that it delivers good technology with better customer experience. The study reveals that 47% buying strategy and trust on a particular brand depends upon the website flexibility and app, while 52% of people said they would first research about the business online before deciding to spend their money. Looking into different surveys and research it is very vital for a company whether it’s small or big business to make a digital solution with excellent customer experience so that they can attract more traffic and audience. This divulges the reason why big giants like Amazon are popular among the customers, also why people always head towards and trust Amazon to buy things without even worrying about the cost as they have trust on the product price as well. A company prioritizing its tech risks by providing a slicker online or mobile experience to the customer would have more chances of retaining its hard-earned consumers. 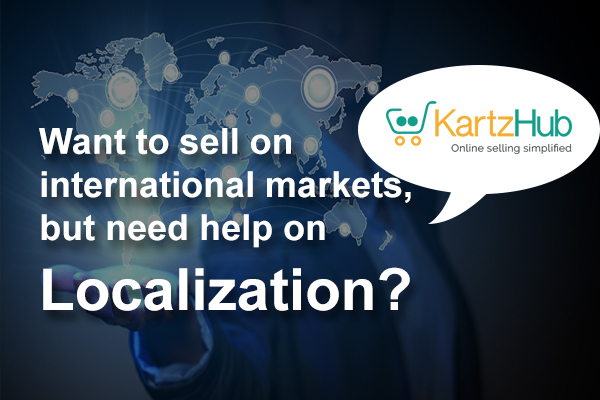 Want to sell on international markets, but need help on Localization? For many of you is a small online business may feel that international markets are reserved for the big boxes who can afford the strategies and resources of the multilingual market. Of course, while selling globally you need to look at several factors like promoting your product in localized language, currency, time, logistics, and many more such things. Just because you are quite not ready to go fully multilingual on your products and marketing, that doesn’t mean that you don’t have a chance to sell on international markets. A little change can help you operate internationally and reach international buyers. Being in the UK you can reach to potential customers of India, US, Malaysia, Singapore, and many more. But you need to follow various laws set by the particular country. While you are opting to reach the global audience, you should be aware of the regional regulations on sales tactics, advertising, and products. Advertising Regulations: In some countries, advertising for certain specific products needs approval by the particular governing body. If you are advertising for a pharmaceutical product then you must get the approval by local health ministries. While comparative advertising in some of the countries is not acceptable. For example, US is completely relaxed of the phrases like “Best” if you are comparing with other brands while Germany has strict principles on this type of messaging. Sales tactics regulations: Various sales tactics like “Buy one get one free”, striking deals, and discounts are structured differently across borders. Make sure your sales tactics don’t conflict with the local laws. Product Laws: While you are selling internationally you should be aware of the product development laws that country is following regarding the safety performance, packaging designs, sizes, languages and material used. For example, chemical makeup – some of the products used in the makeup may be banned on a particular country. These are some of the regional laws you need to look into while selling on international markets. Integration with the international marketplace, warehouses and shipping carriers. And many more Dynamic features to make your international selling a great success. In order to make your international selling a successful affair just try our free 14-day trial or talk to one of our executives to get detailed knowledge of our software. Once you have decided on the products and then selected the best marketplaces to sell the products, the next step would probably be how to drive the sales to your store? Retailers who are successful in this online world did not just launched their store and hoped that everything would go well and business would come easily to them. They tried multiple marketing strategies failed in few and got success in some of them which they finally chose as their best marketing tool to run their business. Being new to this industry if you are short of ideas in order to achieve that first online sale, then check out the list we have put together of the best methods that will help you achieve success. A regular newsletter to the audience is the best way to let the customers know about you. The newsletter should have a first few lines of some of your latest blogs, where people can receive some knowledge out of it and then include the product below and link to “View more details”. Regular newsletter to the E-mail addresses would help to build your product reputation and would nurture your relationship with your subscribers. Drive traffic to the page where the audience can subscribe for a newsletter like putting up ads. Offer Discount coupons to the audience in exchange for an email address. Hold a contest on Facebook where you can give some free gifts to the winners. You can set up a drip email sequence. If you get a new subscriber, then you can set up certain emails that are catchy and knowledgeable. These emails would be automatically sent to the new subscribers at frequent intervals may be for a week or month, where they will get to know about your product and services. Don’t loosen the touch with your subscribers. Send them timely notifications of the upcoming holidays and the special offers you are offering to them. For example Spring clearance sale, Mother’s Day, friendships day, Christmas sale and many more. Write the best blog about your product and what benefits it can offer to the users. You can promote your multiple products on this blog. But, note the blog should be interesting, eye-catching and should be of your customer interest. For example, You can show how your product is made from start to finish, that may interest the customer. Whether you send a newsletter or emails with special promotions, you can offer more discount to your subscribers to boost their motivation and make them purchase. Provide a code and notify them that it’s only available for a certain time period. Facebook has a unique way of advertising where you can select your set of audiences, your budget, and run time. Design a catchy ad and customize your ads as per your choice to reach the target audience. Google Ad Words is one of the most established advertising tools online. Due to its complex working, during the initial phase of the marketing activities, many of you may skip this form of advertising. But you may receive targeted audience from this type of advertising. In Google Ad Words, constant monitoring and doing necessary changes to the campaign is important in order to reach the right audience. But again, the ultimate goal for online sales to grow is to learn about new channels where you can promote your products and not expect profit from every channel. If you have not executed these strategies yet, then here is the time to start and get your first online sale and get busy in fulfilling the orders. What exactly is the shopping cart? It’s a software that acts as an interface between the specific company website and its deeper infrastructure. Shopping cart fills the gap between the sellers and the buyers, so it’s very important to have the best shopping cart in order to have a smooth online process. Over the years there are many shopping carts that have been flooded in the market with different features in its kitty. New sellers often find it difficult where to start from and end up buying the wrong one. Choosing the wrong shopping cart may create havoc in your business as the dysfunctional cart can cripple your online business. If your site is complex and slow then its likely that the customers may abandon the cart even if the product is good. The more you spend your valuable time solving the technical issues there will be less time left to actually concentrate on your marketing activities and fulfilling orders. Do you just want to sell homemade products or start an eCommerce enterprise and make it big? This goal impacts on the type of ecommerce platform you should choose. If you are a beginner you should opt for SAAS (Software as a service) solutions that is easy to use. You need to pay your vendor to access the software, hosting, and security. SAAS solution has limited functionalities and you cannot customize your site as per your needs. If you are old in this business and is aware of the working of shopping cart software E-commerce business then you can opt for the open-source shopping cart. It is difficult to operate, but if you have dedicated developers then you can easily customize the software and do larger changes in the system. But customization comes at a cost. Does your merchandise come in multiple shape and sizes? Do you need product variation features? Are you planning to sell it in different countries? Do you need multi-currency and multi-lingual options? Do you require tax and shipping calculation as per the country you are selling in? Do you want to have the feature of creating and selling the gift card? Do you want the drag and drop theme editor? Do you want the shopping cart saver? Note the features you require and go for the shopping cart that is best suitable for you. Bandwidth: Most of the plans start with a minimum of 1 GB bandwidth and goes up. Know the exact fees before opting for a plan. Storage: If you exceed your monthly storage some platforms charge extra fees. So, do choose a plan that offers a better storage for your images and data. Themes: Most carts offer free basic themes, while some of them charge for the premium templates. Look for the shopping cart that also offers SEO and social media marketing. The shopping cart should enable you to optimize your URL’s for Google search crawlers, have certain add-ons, integrate like and follow button on the product page. The carts should have the required user guides, forums, and documents in case the user needs some help. Other factors you should look into while buying the software is the Ease of use for the sellers as well as the buyers, security and the customer support. Looking for the best shopping cart may be a daunting task. 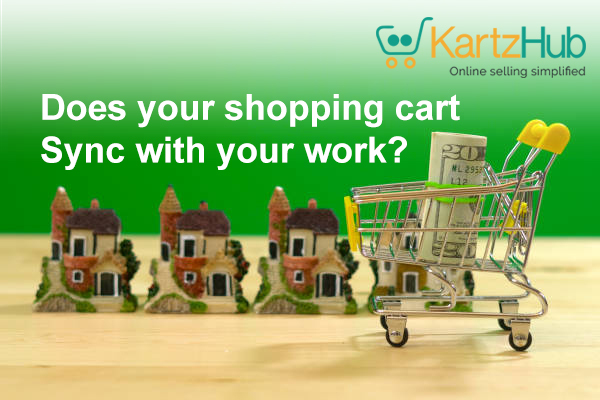 We at KartzHub offer you the Shopping carts as per your business need. Narrow down your option by connecting to one of our executives at KartzHub. Etsy sellers distressed on fee increase, but is it a strategy to attract new sellers? Etsy on Thursday announced the fees increase on every online sale and the new tiered subscription plans for the online sellers. 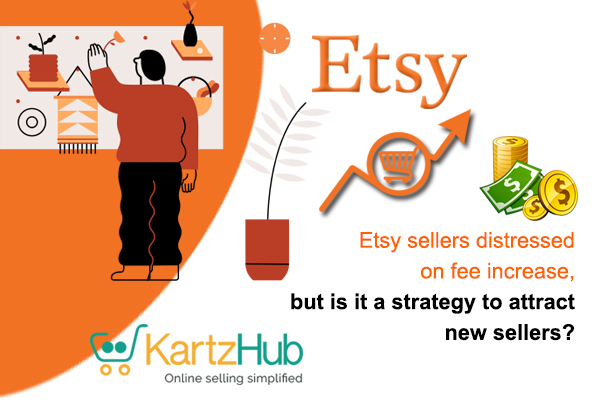 With effect from 16th July 2018, Etsy which is known to be a low-cost platform to trade online has decided to increase its fees. The seller transaction fees will have an upturn from 3.5% to 5%, while another 5% fees will also be applied to shipping costs, which was not at all a part of Etsy fees before. In sync with the fee announcement, Etsy also introduced three level plans “seller packages” which is optional for sellers. First level – standard plan – Include the same tools and services currently available and will be free. Second level – Etsy plus – Includes promotion and customization options and comes with a fee of $10 a month. Third Level – Premium level plan – Includes management tools for big businesses with employees and will also include customer support from sites. This will come into effect from 2019 and the fees is not yet disclosed. Etsy authorities are of the view that they are constantly striving hard to help the sellers to reach their desired goals. So, they have introduced new tools to attract more buyers and run the business effectively. The platform will also increase its advertising massively which will attract more buyers to this site. The new subscription packages will guide a seller through various stages of his business growth. Many sellers think that it would be an unaffordable affair for small businesses like them and so they are looking for new platforms that have lower fees. The increase in fees would have an impact on their final price of the product, which will also increase. But as we spoke to some sellers they feel that Etsy served as a backbone to them through their entire selling journey as they had no resources and they are open to paying more if it yields a better outcome. There were mixed reviews by the online sellers of Etsy. This change would have a better impact on traffic and sales in this online marketplace. It is worth noticing that even if the prices are increased Etsy is still competitive as compared to Amazon and eBay.